Setting out to Wetterhorn Basin in the early morning light. Wetterhorn Peak, a 14,000 foot mountain, sits on the right in this photograph. 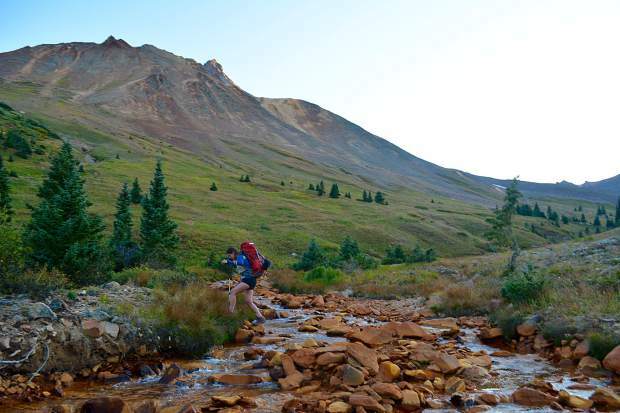 Forging a copper-colored stream on the approach to camp underneath the shadow of Uncompahgre Peak, Colorado's sixth highest 14,000 foot peak. After descending Coxcomb Pass, hikers slowly switch back down, eventually reaching the bottom of Wetterhorn Basin. The peak for which it's named for is the prominent mountain in the distance (on the left). 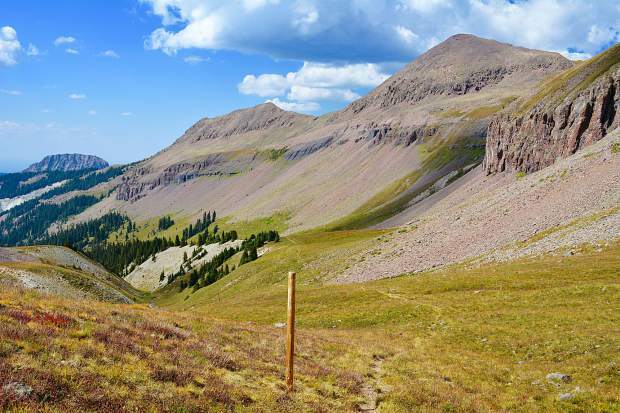 Uncompahgre Peak is Colorado's sixth highest 14,000 foot mountain. The valley floor below it made for a spectacular campsite, especially with the full moon rising overhead. Redirected light from the evening's radiant alpenglow painted colors on the mountains crossed earlier in the day. Forging a stream in the first basin Matterhorn Creek trail dropped into. In the background, extreme vastness and a rock wall with a series of small waterfalls pouring over its precipice. Traversing a grassy slope, while simultaneously descending into the magnificent Wetterhorn Basin. 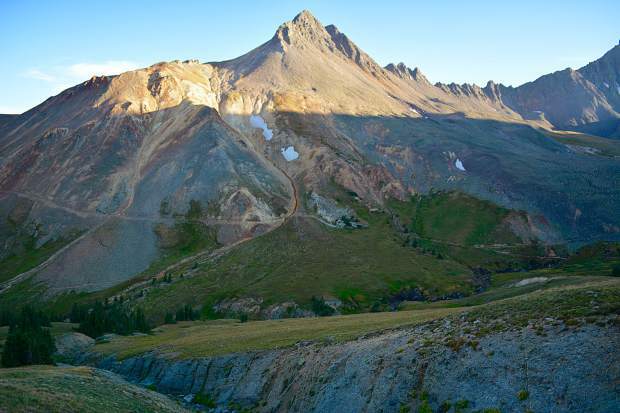 Wetterhorn Peak (on the right) is a 14,000 foot mountain in the San Juan range. Early morning light touches the far hillside, but has yet to touch the valley in the foreground. Although only September, there was frost on the ground the morning this photo was taken. 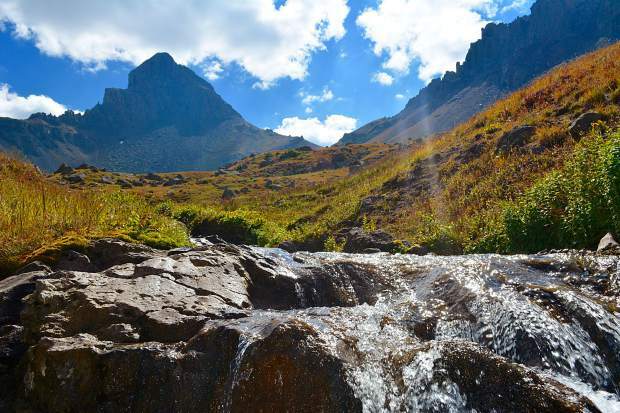 A healhty, swift-moving stream in Wetterhorn Basin and a great water source for backpackers in the Uncompahgre Wilderness. 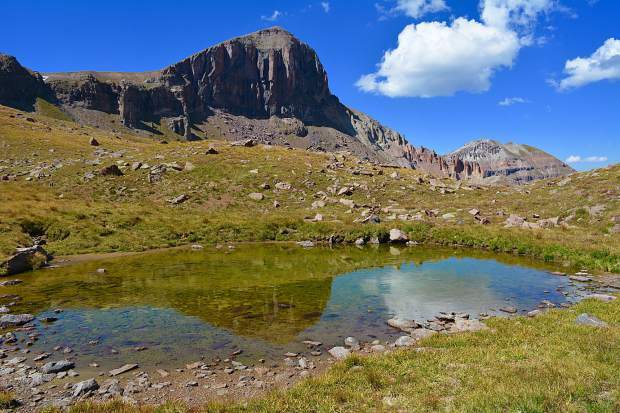 A stunning reflection of an unnamed 13,000 foot mountain in a shallow pool within the Uncompahgre Wilderness area in the San Juan mountain Range. Although there was a shortage of signs, there was no shortage of wooden posts. Presumed to be put in by the forest service, the wooden poles were scattered along the hillsides and valley floors. 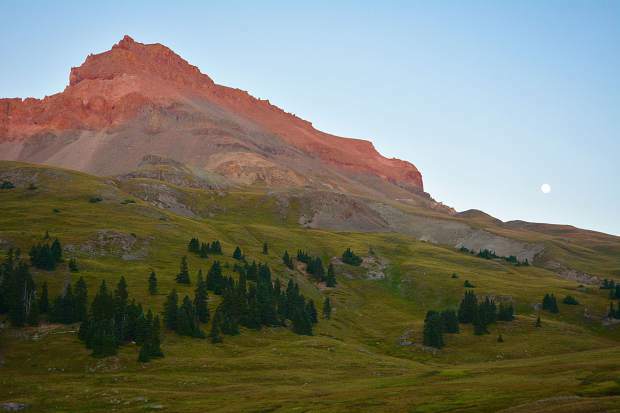 Matterhorn Peak, a mountain in the San Juan Range, getting the last bit of sunshine on a cool September evening. A pivotal moment in the 22-mile trek: The first trail sign seen since the start at Matterhorn Creek trail some three hours earlier. 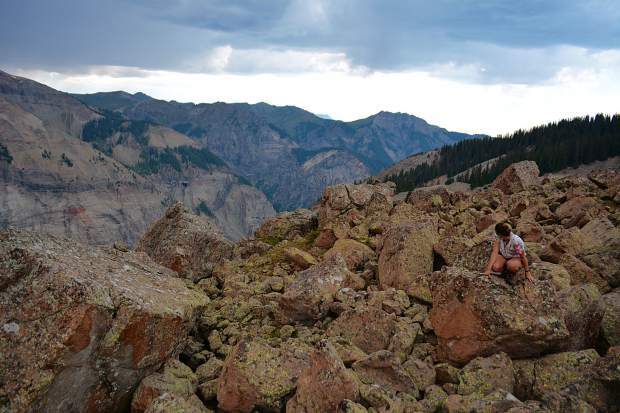 A boulder yard with some rocks larger than cars was encountered during the first day of the trek through the Uncompahgre Wilderness. 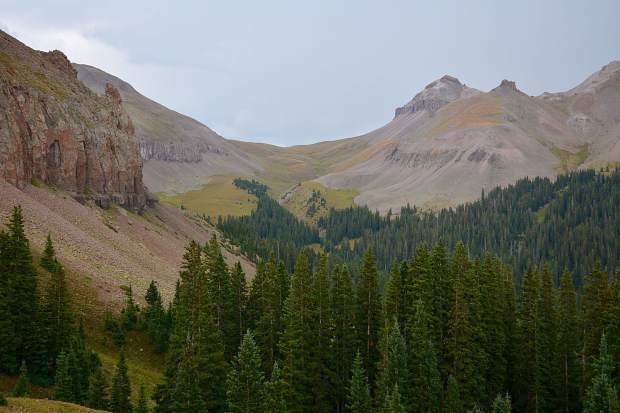 Looking from a hilltop towards the first pass in the Uncompahgre Wilderness. 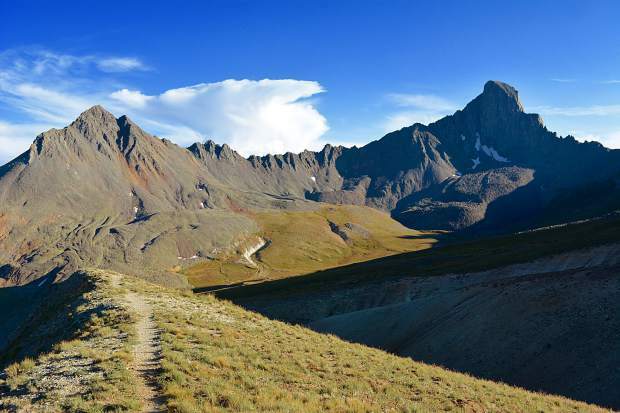 In this vast wilderness, there are numerous intersecting trail systems to choose from. 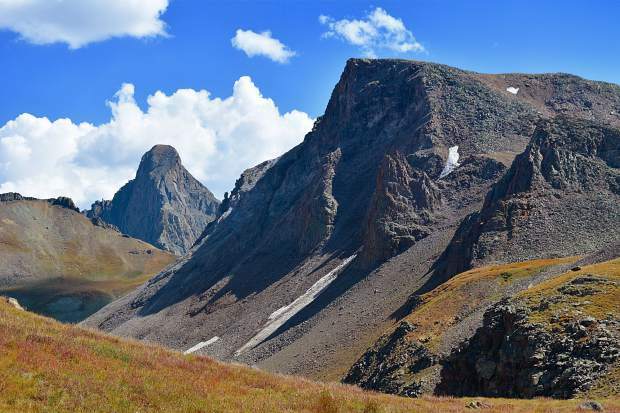 Two grand peaks in the San Juan Mountain Range of Colorado. 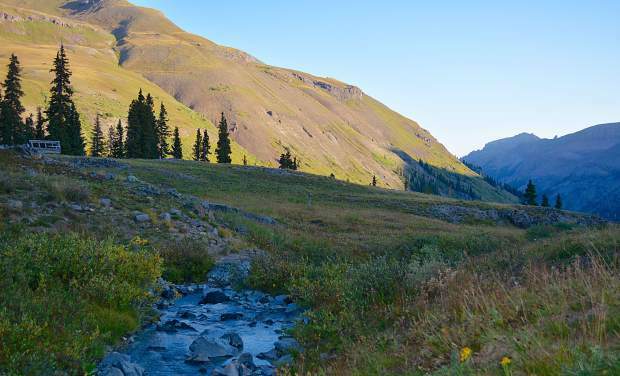 Matterhorn (on the left) and Wetterhorn (on the right) are both in the Uncompahgre Wilderness. The author refering to the map, and stealing a glance at Wetterhorn Peak. 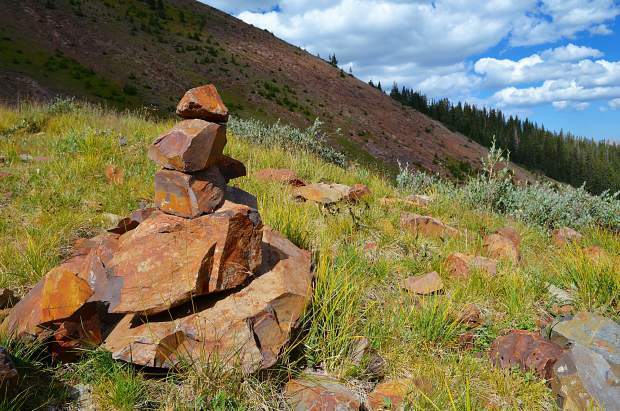 One of the many rock stacks, called cairns, seen along the trail through the Uncompahgre Wilderness outside Lake City, Colorado. Getting there: From Lake City, head south on Gunnison Avenue toward Fourth Street. Then take an immediate right onto Second Street. After roughly 400 feet, take a left on North Bluff Street. From here, continue on County Road 20 for about 9 miles. This is a rough non-paved road. You will travel through Henson. Then, turn right onto County Road 24. 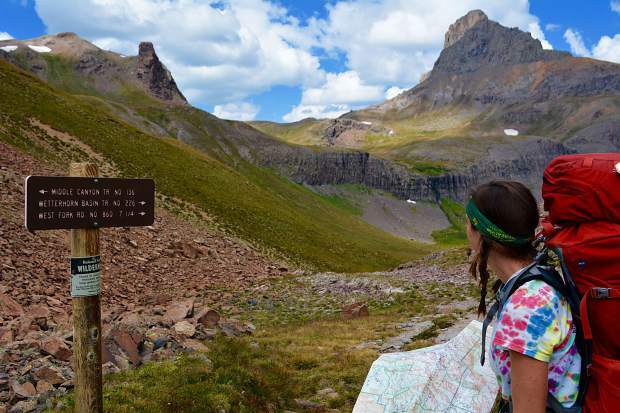 Follow this for 2 miles, and you will see a trailhead sign for Matterhorn Creek trailhead. The road up to the trailhead is very rough four-wheel-drive road. 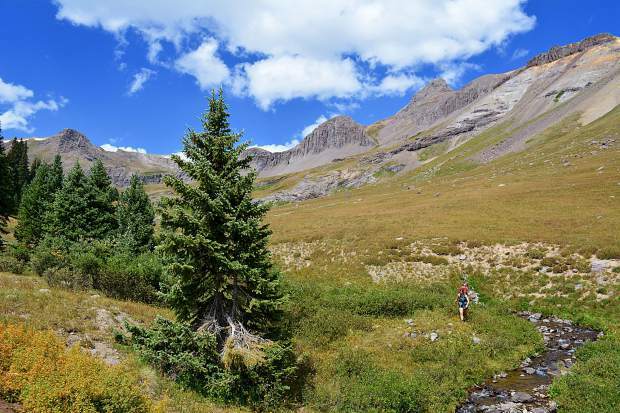 Our loop in the Uncompahgre Wilderness area can also be accessed by Uncompahgre Peak Trail, which you will pass on route to Matterhorn Creek. Dark was falling, thunder was overhead and the trail was becoming less and less straightforward. Really, it was more of a faint suggestion than a trail. We knew better than to get off course, but it was only a brief detour. Both Olivia — my oldest friend and the person I credit partially for my hiking obsession — and I are from Virginia. 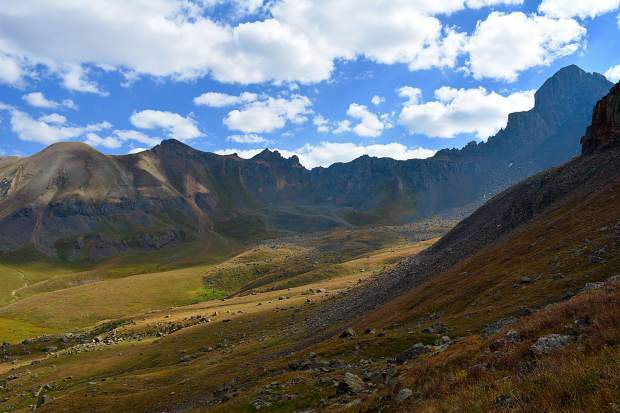 We’d commented numerous times on the vastness of Colorado landscape, unlike the “tunnel of green” one feels on the Appalachian Trail, and other hikes in the Blue Ridge. 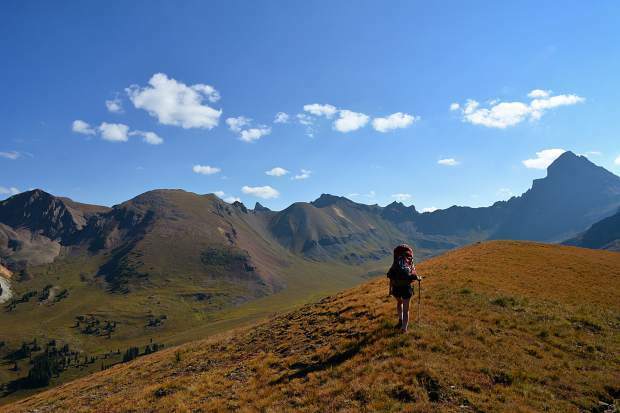 Here in the Rocky Mountains, you can see the terrain you’ve covered and what lies ahead. That openness comes into play in a favorable way when following these faint trails. So do cairns. We hadn’t seen a sign since the first pass we went over, where the trail split a couple ways and we stayed on Matterhorn Creek Trail. From the top of the pass, we officially were entering the Uncompahgre Wilderness. Dotting the gentle slope, there were a series of wooden poles driven into the ground. My eyes traced the valley floor and I could count four posts. About 100 feet from one to the next, the wooden poles were a source of guidance. Like slalom skiing, we maneuvered our way between the stakes, gradually reaching a stream where the beams simply stopped. No poles. Our options were to go straight (south) into a thick forest or bear right (west) and forge the stream. We threw our packs off, stopping for a water fill up. Stacked astutely, a flinty pyramid rested atop a boulder as big as my car. Cairns are a source of wordless communication between one hiker and another. It can take days, weeks or months for the message to get delivered depending on how popular the trail is. But this sign from a fellow hiker had been received and I was grateful for it. It didn’t detract from the sense of wildness for me, it only added to the grand mysticism of a wonderfully lush and vast valley. From the stream, on to another valley dotted with wooden posts. But only briefly, for we soon found ourselves in a dense forest with moss, thick undergrowth and evening dew. There were cairns scattered throughout the woods, adorning the tops of stumps, downed logs, stony surfaces and even the ground floor; all simple suggestions to keep us on our path. The trail deposited us in a boulder yard. Lichens and moss glistened on the rocks. Some of the boulders were massive, bigger than cars, boats — some of them bigger than houses. I looked at the boulders and back at Olivia. We looked overhead at the angry clouds and quickly approaching darkness and back at the boulders. Shamelessly, we let the boulders distract us, jumping from rock to rock, gaining distance from where we set our packs down. Eventually reigning ourselves in, we pieced together a series of leaps back through the boulder yard. We slung the packs back on and immediately were faced with a decision. We have a faint trail straight ahead. There are cairns here, too, but we see another trail on our left. It’s more defined and appears to be the path most followed. This would have been a great moment to reference the map or reinvest our faith in cairns. Instead, we take the faint trail on the left and after half an hour of steep descent and some bushwhacking, the trail completely dies away at the edge of a forest. With a crazed look in my eyes, I’m starting to think everything is a trail. Throwing down our packs, Olivia and I follow anything resembling a trail. None of them seemed promising — all animal trails, we guessed. Claiming ourselves officially — slightly — lost, we decided to stay put until morning. There are worse places to be lost than in the shadow of Wetterhorn Peak, a 14,000-foot mountain, with wicked colorful alpenglow. As we set up our tent, we discussed the moves we needed to make in the morning in order to find our trail. We had missed something, no doubt about it. But, it was hard to be sure what it was we had missed when there were no signs and plenty of faint trails dotting the landscape. It was decided that we would return to the boulder yard in the morning, and take the other trail, the trail that had cairns accompanying it. In the morning, we did just that. With some similar bushwhacking experiences and our senses of sight and intuition fully deployed, we made it to the top of the ridgeline that looked down on the boulder yard. We could see the line we needed to take, and more wooden posts. Then turned to see the trail we needed on the backside of the ridge, which would have taken us between two 12,000-foot mounds. It should have been obvious, but alas, boulder yards are very fun. It would have been nice here for fellow travelers to make this easy-to-overlook turn in the trail more apparent. Yes, one cairn helps, but why not a huge pyramidal cairn? I have set up cairns before, namely on Mount Guyot, where there isn’t an official route, but there is a route of least resistance. The cairns I’ve set up have never been decorative ones, but stacks of purpose. They are suggestions, escorts left behind for other hikers needing guidance. They shouldn’t be put up for decorative reasons, as unnecessary markers of humanity. Not random, but purposeful. And later on in our hike, the cairns did come into play again. We encountered swampy marshlands in the Wetterhorn Basin, where the trail was basically nonexistent, taken over by mud. Without the wooden posts or chance cairns, we probably would have had an even harder time staying on route. In our circumnavigation of Wetterhorn, Matterhorn and Uncompahgre, we saw no other humans for nearly 36 hours. Aside from the faint screams of pika and marmot, it was only our laughter and singing (cue John Denver, Fleetwood Mac) that hung in the air. How freeing it was to see nearly no one and to have such wildness to ourselves; though, how comforting it was to catch glimpses of cairns. We covered so much ground in our 22 miles. We went up and over four or five ridges, dropped into numerous basins, drank from the crystal clear streams of various valley floors and yet, barely saw another soul besides each other as we moved around massive mountains, undecaying monuments. I had gratified my curiosity. We’d seen the many faces of Wetterhorn — a peak that literally looks like a different mountain depending on which side you’re looking at — after staring longingly at it in pictures for some time. We’d slept underneath the towering summit of Uncompahgre with a full moon over us. And, what a phenomenon we’d grasped: to see where we’d gone and where we were going. 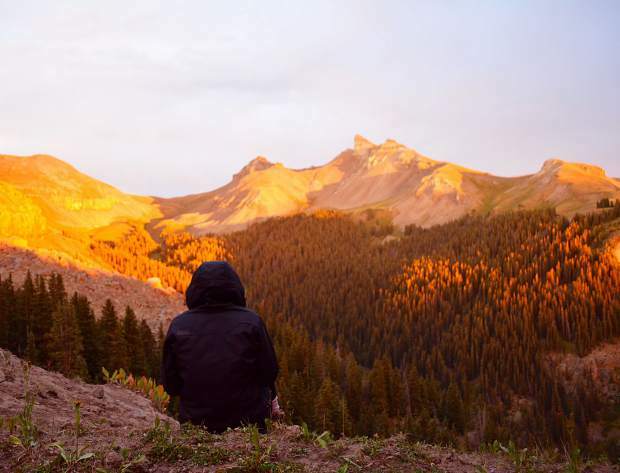 The Uncompahgre Wilderness is immensely vast and breathtakingly wild. 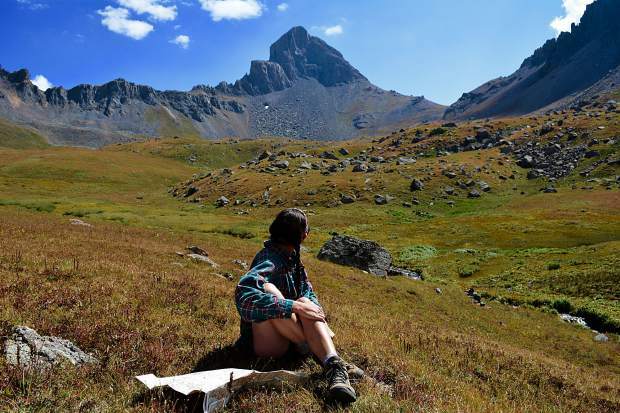 Aside from boot prints and respect, we’d left nothing there — leaving Uncompahgre just as wild as we’d found it. Though, I had taken with me a sense of gratitude and a renewed feeling of self-sufficiency. Our place was in the wild, and all we needed was in our packs, on our backs.